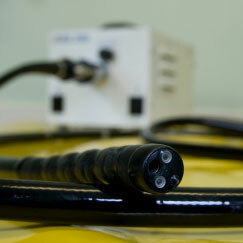 Endoscopic surgical components are becoming smaller and more complex every day. Cadence has been the supplier of choice for incision components used in the endoscopic surgery for many years. Our breadth of experience in this medical device market allows us to work closely with medical device OEMs in a way that fully enables innovative and highly specialized endoscopic solutions. These endoscopic procedures demand components with the highest precision and reliability. These products are often manufactured from the most specialized metals, such as Nitinol or Titanium. Our customers come to us looking for the knowledgebase we have surrounding incision technology and find our “Center of Excellence” for incision applications to be compelling and a cornerstone of future partnerships. Endoscopic Instruments - Endoscopic surgery is a relatively new procedure that provides an alternative to traditional open surgery. Also known as minimally invasive surgery, endoscopic procedures have created a specialized field that demands specialized instruments. Endoscopic instruments can range from scalpels and surgical blades to specialized devices like trocars and punches. Specializing in these types of instruments, Cadence takes pride in its position as suppliers of blades for these innovative procedures. Recently there's been a rise of endoscopic options for plastic surgery, knee surgeries and even formerly major operations like gall bladder removal and endoscopic surgery of the spine. With these medical breakthroughs come breakthroughs in medical tools, and Cadence leads the way in endoscopic instruments. While many surgical instruments designed for conventional open surgeries have been adapted to endoscopic use, Cadence works with surgeons to design instruments specifically for minimally invasive procedures. Cadence's Dedication to Endoscopic Instruments - While endoscopic surgery may be considered surgery on a smaller scale, more attention is given to the construction of instruments used in these procedures. As a result of more specific requirements, the industry has had to change with the progress and Cadence is a good example of what is being done. With a dedication to product design and development, Cadence can claim to be a leader in the field. Whether it's a sharper tool, a more durable material or a non-corrosive coating alternative, Cadence can custom design endoscopic instruments to meet your unique specifications. Just as patients expect surgeons to be specialists in their fields, surgeons should expect their instruments to be created by specialists. Surgeon feedback drives need for lower “force to fire” from Cadence - A key surgical device platform technology was suffering from on-going complaints from surgeons. The complaints related specifically to the amount of force that a surgeon needed to exert by hand in order to get the surgical instrument to fully complete its cutting cycle. Applications engineers from Cadence worked concurrently with design engineers from the medical device OEM in a rapid prototyping environment to help an isolate the mechanical design flaw that created the high cutting force. Producing different cutting edge geometries via a proprietary sharpening process demonstrated the significant effect that the ultimate cutting edge geometry and related sharpness had on the “force to fire”. The sharpest lot of new knives were so sharp that the surgeons actually lost all tactile feel in the use of the device, so a formal “Design of Experiments” was utilized to optimize the sharpness of the edge as compared to the required desired amount of tactic feedback needed during use of the device. The ultimate difference in cutting performance was accurately quantified in our IncisionLab™and a cut force test was developed to assure on-going quality control during production. Results for the surgeon were dramatic! The problems associated with the high “force to fire” were totally eliminated along with any concern for cutting performance.